In some sense, Laura Poitras’s Edward Snowden documentary, Citizenfour, is an action film. Its action only seems anticlimactic. We’re talking about SD cards and keystrokes, conversations that lead to stories that wind up in the papers and on the Internet. Not much more than a year ago, Snowden, a National Security Agency contractor, leaked reams of classified information about the United States’s surveillance programs to the news media, igniting a global WTF about the erosion of privacy. The stories caused a firestorm, but from the stifling comfort of Snowden’s Hong Kong hotel room, the flames are barely visible. All of our Oscar coverage! Much of this extraordinary, high-stakes film is an on-the-spot rendering of Snowden. He emerges as something more like a real human being than the cartoonish, treasonous, self-aggrandizing cybervillain he’s sometimes made out to be — the kind you get in modern depictions of malignant technological savvy on House of Cards or in the Dragon Tattoo series — or the crusading saint others claim he is. There were contradictory characterizations of Snowden by the pundits, the president, the public: hero, traitor, hacker, liar. In Citizenfour, none of that applies and little of it matters. This Snowden — Poitras’s Snowden — is plain, even-keeled. He speaks in a deep, mild voice with a Southern twang and a Mid-Atlantic roundness that gives him a real sense of place. (He’s from North Carolina and Maryland.) He’s usually in a T-shirt and glasses. He’s 29, and when the story broke of the surveillance programs, there were attempts to psychologize him — he was a narcissist, a megalomaniac. Here, he seems older than he is. But there’s only the most basic sense of decency about him, nothing arrogant, self-regarding, or indignant. His decision to release the NSA information appears to have been well thought out. He is concerned for the well-being and safety of his girlfriend, who was on vacation when he disappeared from her life and the NSA, but any emotional agony over abandoning his family and friends never surfaces in his demeanor. (His plan is the rationalized version of Amy Dunne’s vengeful vanishing act in Gone Girl.) Whatever righteousness Snowden exhibits doesn’t extend beyond an essential sense that the intelligence community has systematically abused its power. “I feel good,” he says early into things, “that I’ve given something for the good of others.” That’s as close to self-aggrandizement as he comes. A lot of Citizenfour consists of Snowden sitting around, with a computer on his lap or several computers spread about his bed. He does this the way one might wait for someone to respond to a text. People are always staring at screens in techno-thrillers and forensic crime shows. When Snowden does so here, it’s to find how badly the NSA is treating his girlfriend, to see how far down the rabbit hole he’s leapt. But in reaching out to Poitras and the American journalist Glenn Greenwald, in allowing her to film him passing along government secrets to Greenwald, he knew there’d be no clambering back up out of the hole. The film’s pivot point is Snowden’s coming out as the whistleblower. He does so in an iconic interview for Poitras’s camera. He’s in a gray shirt, seated at an angle, and framed so his reflection sits behind him in a mirror. Afterward, he can see his face all over the Internet and cable, and there’s some comedy in his trying to find the right way to change his appearance. It’s almost touching watching such an earnest person basically trying to figure out how Jason Bourne and Harrison Ford in The Fugitive manage to evade capture with just a shave and a baseball cap. Of course, optics play a role in whatever apprehension the general public has about Snowden. The news tended to make him bigger and more dangerous than the Big Brother scenario he laid out. Poitras restores the balance between the whistleblower and the whistled-upon. It’s hard to overstate the film’s achievement. It takes places in the days and minutes leading up to the leaks that spill onto the pages of the Guardian, the Washington Post, and the New York Times, and in the gradual aftermath, with the timed release of each new bombshell in the ensuing weeks. There have been other movies about spying and paranoia, about being spied on and consequently paranoid. Citizenfour embodies the revulsion that all of this extreme surveillance should make us feel. This is the first movie I’ve seen since All the President’s Men — in its own way, also very much about surveillance and corruption — that takes stock of a current political event as it roils and ripples out, leaving its audience with a heavy, sick feeling. “It’s become an expectation that we’re being watched,” someone says in Citizenfour. But Snowden — and by extension Poitras and Greenwald — believe that’s an unreasonable expectation. Alan J. Pakula restaged the Watergate scandal in All the President’s Men with a clear retrospective blueprint. His movie was based on Bob Woodward and Carl Bernstein’s 1974 account of their reporting on the scandal for the Washington Post and follows their lead. Richard Nixon had resigned by the time the film came out in 1976. Pakula applied the atmospherics of a paranoia horror thriller to a story about a different sort of political surveillance apparatus. I saw it on television as a kid and remember the voices croaking out of the telephone receivers, the machine-gunning of typewriters, and all the shadows giving me nightmares. Poitras’s achievement might be more significant. She has shaped her quietly dramatic film before the dust has settled on its central subject. The scope of Citizenfour is vast yet often atomic. When it leaves the hotel, it’s to follow Greenwald as he attempts to fan out the story in England, the States, and Brazil, where he lives. Poitras includes Snowden’s initial conversations with Greenwald, who brings along Ewen MacAskill, a Scotsman who covers security and defense for the Guardian. She folds in footage from the European Parliament Privacy Platform, a panel discussion from October of last year, which includes the hacker Jacob Appelbaum and Ladar Levison, who created the Lavabit encryption software Snowden used. There are passages devoted to William Binney, the former intelligence official who blew the whistle on the NSA not long after the September 11 attacks, who’s shown entering, to great fanfare, a German government hearing on the NSA. The film traces the reach of the outrage — Greenwald’s reportorial crusading, Binney’s speaking out, the interest of other journalists — and its implications: the detainment, for instance, of Greenwald’s Brazilian partner at Heathrow Airport in the summer of 2013. But it never loses sight of Snowden. The film doesn’t seek his exoneration. It dares, instead, to present a clarification of the whistleblower. His fate still feels like a legal matter. And there are scores of questions about how to charge him and what to charge him with, should he ever return or be returned to the U.S. But suspended in real time, with the planet closing in on Snowden, Poitras can’t help forging empathy with him. This project has been known to be in the works almost since the appearance of those first stories. I’ll plead an early wariness about this entire project — about the possibility that Poitras had allowed herself to be roped into Snowden’s decision; that there would be a kind of unchecked alignment with Snowden, with the treasonous cyberpunk; that Greenwald would function (not unself-consciously) as both Woodward and Bernstein; that an agenda would outpace the filmmaking. That it could be called Let’s Be Martyrs. But there’s nothing naive about Poitras’s approach, nothing self-congratulatory either. Snowden isn’t charming — or Poitras’s movie isn’t charmed by him. She and Greenwald appear to know what they’ve signed up for. In the film’s opening image, a truck drives into a dark tunnel. She’s operating the camera. He’s working as Snowden’s news-gathering exponent. Citizenfour is told as much from their points of views as Snowden’s. Poitras doesn’t gin up a false sense of menace. In the opening minutes, some of the text Snowden used to reach out to Poitras types itself across the movie screen. She may not be trying to scare us, but we’re scared for her, and for everyone else who tries to advance this story. The paranoia cuts both ways. It can be comically procedural, like when Snowden sees Greenwald commit a security blunder and turns into a guy from the IT desk: “Pro tip? Let’s not leave the same SD card in laptop forever.” It can be otherworldly, like when a hotel fire alarm goes off while they’re trying to set up an encryption system. These sort of moments were missing from Poitras’s filmmaking in the past, which has recently been committed to stories told out of Iraq (My Country, My Country) and interested in men affiliated with Al-Qaeda (The Oath). She’s said her films have landed her on a Homeland Security watch list. She currently lives in Germany, and she’s had to do some of the rollout for this new movie via Skype. Citizenfour forgoes her usual elliptical devices for something cleaner and more exact. Maybe her journalism benefits from exposure to Greenwald’s. Maybe she thought the story was too valuable to risk too much poetry. There’s lyricism nonetheless. It just happens to coincide with the film’s mounting sense of fear. At some point, Greenwald tells Snowden something that the latter can’t believe. They’re communicating by scribbling wildly on paper. The camera lingers on the pile of scraps they’ve left, and a chill goes through you. It’s a vision of the future. Do we need another satire of race? When it’s asked that way, maybe not. “Satire of race” sounds like “mockery.” And yet the moment appears ripe for sustained ribbing, at least, of blackness and whiteness. ABC’s Black-ish, about the meaning of blackness in 2014, gets stronger and stranger (and more popular) by the week. It is not a perfect or even believable show, but it has a perfect premise, and it is the closest thing since the dearly departed Happy Endings that network television has come to Seinfeld’s — or South Park’s — conflation of the arbitrary, the rude, and the profound. Then there’s something like The Knick on Cinemax, which, in its 10-episode season, performed one of the most sophisticated literary and visual waltzes between race and racism I think I’ve seen on a show that isn’t built for laughs. 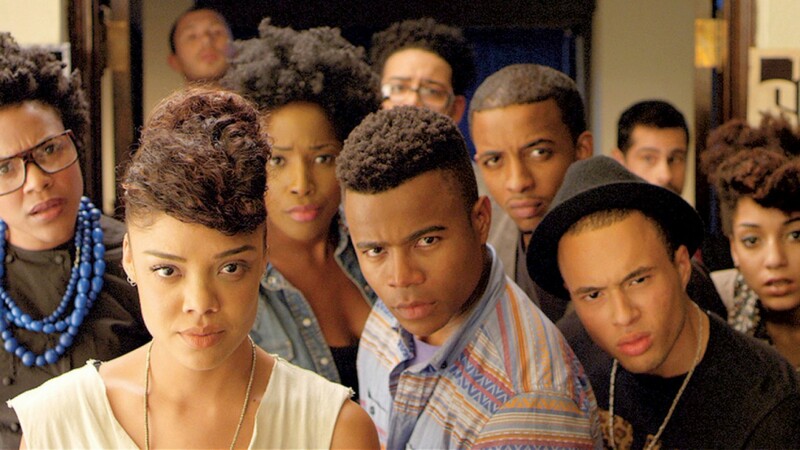 Justin Simien’s Dear White People arrives at a slight disadvantage. As a movie, it can’t reshuffle or rethink itself based on the cheers and jeers of the commentariat. The film is what it is. And it happens to be a pungent, bone-dry farce of race — not as it exists in the world, per se, but as it exists in the very particular hothouse of the American college campus (the setting is a fictional Ivy League school). I know black people — the educated, well-to-do, young and youngish audience a movie like this needs — who’ve surmised that they don’t need this. They lived through Spike Lee’s School Daze and John Singleton’s Higher Learning. There’s a perception that we’ve outgrown this kind of chip-on-the-shoulder racial battle royal. The mess and funk of something like Key & Peele might be easier to take because its surfaces are all Teflon. We’re supposed to be past all of this — the agonies of identity, or the performance of the agony. The other night I rewatched Simien’s movie, his first. I had seen it in January and remembered it being faster, more rambunctious, and more unruly. But his camera doesn’t do much more than standard tracking shots. He mostly relies on framing and reaction shots that violate the way reverse shots operate — they’re symmetrical, so that two people looking at or talking to each other are doing so in separate shots, in which it looks as if they’re addressing the camera. Most of the movie has been photographed from a low angle. It’s as if most of the action is taking place up on a pedestal. It’s as if, to take it all in, it’s necessary to lean back. The breakneck pacing and rubbery energy you’d expect — the energy I misremembered — is actually slower and more patient. Simien’s got some good jokes and sight gags. This isn’t Teflon comedy. He wants the punch lines to stick. The actors — Tyler James Williams, Tessa Thompson, Teyonah Parris, Brandon P. Bell, Kyle Gallner, Marque Richardson, Justin Dobies, and Dennis Haysbert as the dean — speak low and deliberately. They sublimate the angst into something languid and cool. Yes, some of that slowness is slow because the editing doesn’t know how much of a shot or scene is necessary for a sequence or a transition. The movie is 108 minutes. It should probably be 90. A lot of the comedy isn’t ha ha ha stuff, the kind Black-ish traffics in. Simien is going for something else: mounting comedy that seems also blasé. The gags create a fuse to a firecracker finale. I was supposed to leave my second screening with about 30 minutes to go, but I decided to stay and arrive late for my next appointment. I knew that all that was left was the racist Halloween rager (and ensuing riot) started by the campus humor magazine, Pastiche, whose white-dude, black-slang-slinging staff could all be played by Jason Sudeikis — except for the editor (Gallner). He’s like Robert Pattinson playing James Dean’s T-shirt in Rebel Without a Cause. The party contains all the movie’s most disturbing images of appropriation and hypocrisy. The movie appropriates some of Lee’s current snobbery (lumps for Tyler Perry), his plotlines, and old tricks (those reverse shots, the ensembles speaking to the camera, the spitballing of slurs and presumptions). Lee isn’t using them anymore. But there’s a lot of framing that’s out of Ozu and Bergman, too. Simien is just as much a film student as Damien Chazelle, whose second feature, the music-school abuse thriller Whiplash, opened this month, and who tries to electrify you with his talent. Simien’s doing portraiture, not Chazelle’s action painting. In Simien’s film, we’ve reached a point at which white people are just as comfortable with — and just as capable of — policing so-called authentic blackness as black people are. Sometimes those white police abuse their power. This movie is, at least partially, about the effects of that abuse. Not all the jokes are funny or timeless. Some of them are simply tired. But themes of what kind of black person — and, for that matter, what kind of white person — one should be are modern and loaded. They’re not post-anything.